Shrewsbury Town have signed midfielder James Wallace on loan from Sheffield United until the end of the season. The former Everton trainee will be making a return to Oteley Road, having spent two months on loan in Shropshire four seasons ago. He becomes the fifth signing of the January window by boss Micky Mellon. 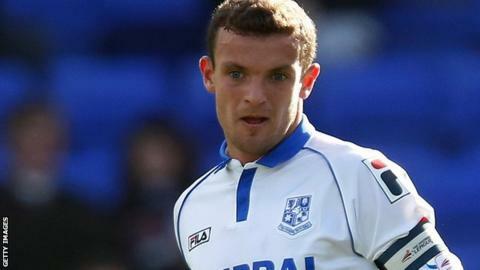 Fulham loanee Jack Grimmer, midfielder Richie Wellens (Doncaster) and strikers Kyle Vassell (Peterborough) and Andy Mangan (Tranmere) have come in. But Northern Ireland Under-21 player Darren McKnight has become the fifth player to leave, having not started since signing in the summer. McKnight's departure follows that of striker Tyrone Barnett, who has joined fellow League One side Southend United, while top scorer James Collins has been loaned to League Two promotion challengers Northampton Town. Captain Liam Lawrence has also dropped down a level, to join Bristol Rovers, while defender Mark Ellis has completed his move to another League Two side, Carlisle United. Wallace, 24, has joined fellow League One side Shrewsbury in the hope of regular first-team football, having been limited by injuries to just 20 appearances for the Blades since signing from Tranmere in June 2014. Shrewsbury remain just a point clear of danger in League One, but have been much lifted by Sunday's FA Cup third round win at Cardiff City, which has earned a home fourth round tie against another Championship side, Sheffield Wednesday, on 20 January.